A woman escapes drudgery when she discovers a way to make the necessities of life a work of art? Every roasted chicken and freshly planted flowerbed begin reflecting an artist’s consideration for design and composition. While raising her children and keeping her house she hones her craft with care and attention to detail. And she sees, as the old words from Genesis put it, that it is good. I used to read Edith Schaeffer’s books. I became a mother sixteen days before my sixteenth birthday. Not the best of beginnings. Edith’s, What is a Family?, helped me grasp the importance of my role beyond just the care & feeding of small children. She became a spiritual mentor and a ‘significant contributor’ to my life and family. But it was her book, The Hidden Art of Homemaking, that exploded my understanding of what was possible. The way we look at things has tremendous power to shape our experience of them. I began to embrace the art in daily duties and found a liberation that I believe only creative endeavors can provide. All this was mine years before HGTV, Martha Stewart, or the Cooking Channel existed. Frankie Schaeffer wrote a tribute to his mother for The Huffington Post. 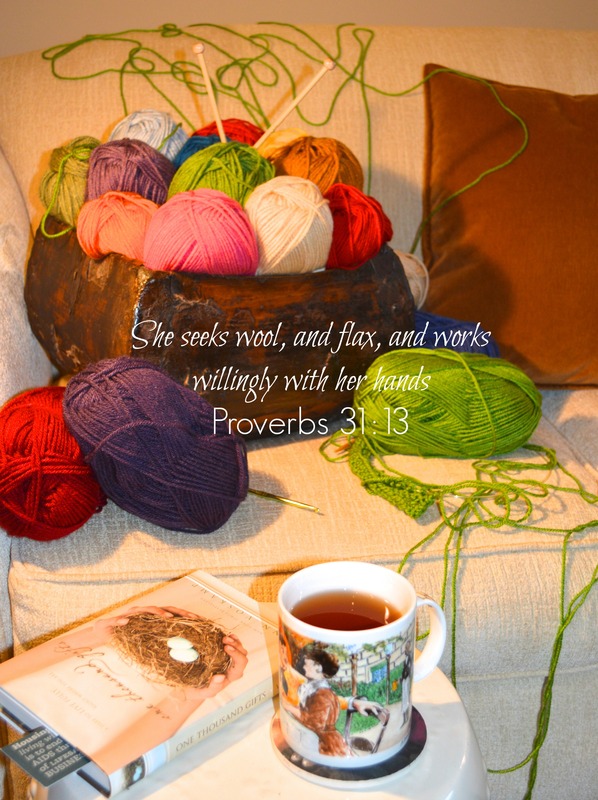 Long before Edith Schaeffer, one woman, our Proverbs 31 woman, learned that art was exhilarating, that creating was divine business. Energy soared, not diminished, as she went from one creative venture to another throughout her day. Captivated by the beauty and usefulness of everything she made, her satisfaction in it all an epiphany. Does willingly say it well? Joyfully, yes joyfully says it best. I believe it was you who gave me my first copy of The Hidden Art of Homemaking to read when I was a young wife (many years ago). I have never forgotten that sweet sentiment…and I read it! It set a fresh flame of excitement in me to make every space I was in the most pleasant and beautiful environment…because truly God is the Masterful Creator of all truth and beauty. No matter, over the years, how much we had or didn’t have, it was so satisfying allowing those creative juices to flow and be a blessing to others. In fact, I read the book several years ago with my daughter and even made it a “Home Ec” class we worked through in her high school years. She now is practicing the hidden art of home making in the spaces she has lived in….dorm room or apartment. I think Edith Schaeffer would have felt the art in everything you make. You’re one of the faithful who put truth into practice and then pass it on to your own child. I’ve always had a secret wish to own a flower shop. In my dream it’s a Flower Shoppe, on an incredibly charming and gracious cobblestone lane and immune to any economic downturns. That’s why it’s a dream.